What You Should Know: Provides background information. What You Should Look For: Provides assessment information. 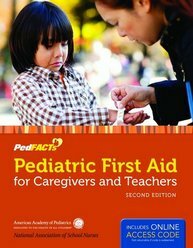 The PedFACTs course also covers the “4Cs of Pediatric First Aid” help focus providers on the steps they need to take to safely manage emergencies: Check, Call, Care, and Complete. New to the Second Edition, instructors can choose to teach the entire course in the classroom setting or have their students take the 2-hour online course before coming to class for the on-site skills and scenarios. A free access code that provides admittance to this 2-hour online course is included with each participant manual.